It is very easy to forget that The Present Age is only made up two people, brothers Isaac and Logan Lamers, when listening to their music. Even watching them live you end up forgetting there’s only two people because they play with such passion and energy. Their trick to pull this off is creating a sound that’s so intricately simple and beautiful. It’s youthful, passionate, and enchanting. We usually try to avoid throwing around too many superlatives when writing reviews, but these are the only words to describe them. Their EP You’re Everything dropped back in May and it’s been a favorite of ours. Each track is full of indie charm along the lines of bands like Jaws or Deer Tick, blending the use of guitar and piano so well. The lyrics themselves are well crafted and aided by frontman Logan’s vocals that switch from soft and airy to aggressive and passionate. Lines like “I’m told that I lack the proper skills to show how I feel, all my life consists of finding ways to off myself every day” from Don’t Stay and “The weather is matching my emotions with an emphasis I lack” from What Nothing Means to Me can hit home with listeners in a way that other bands can only hope to accomplish. You’re Everything is an incredible EP and if it’s a benchmark of what The Present Age can do then it’s a hell of a good way to start. 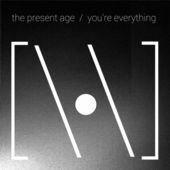 You can check out The Present Age’s Facebook and download their EP on iTunes here.